How much do they look like an indie rock band of today? How much do the bands of today look like them? How many owe them? I've always found it somewhat odd--yet strangely appropriate--that nearly every picture of Joy Division you ever find is in black and white. Seriously, do a Google image search of Joy Division and check. Here. I mean, it's not like this was a band from the '50s. The band was born in 1977 and was done by 1980. I expect to see Buddy Holly and British Invasion-era Beatles and Rolling Stones in black and white. But by the late 70's everything was in color--arguably too much so. And maybe that's where the "strangely appropriate" part comes in. There is something distinctly black, white, and gray about Joy Division--from their image, to their roots (Machester, England), to their sound. Whereas a Daft Punk or a Flaming Lips or a Yeasayer or a Vampire Weekend or even a Lady Gaga evokes a sonic mental pallet of Skittles storm-inducing colors, Joy Division embraced black and white and gray. But they did so while squeezing every bit of dark, emotional power out of those colors. Set against the contrasting American backdrop of disco cliche and raw punk rock angst, Joy Division were pioneers of post-punk in Britain. Punk rock energy turned inward with added layers and complexity--all while never losing the raw power that makes punk rock great. The legendary, albeit tragic story of Joy Division has been told countless times. 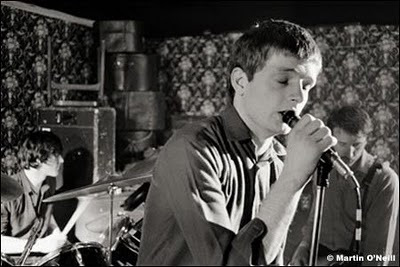 The band was around long enough to complete several brilliant singles and two groundbreaking albums--1979's Unknown Pleasures (which still has my favorite album cover of all time) and 1980's Closer--a tortured, eloquent, and striking farewell to the world by young lead singer and songwriter Ian Curtis. Two posthumus albums exist that are extremely relevant--1981's Still (which contains a haunting--if ultimately poorly documented--recording of their final concert as well as a handful of their more hard to find singles) and 1988's absolutely essential Substance which collects some of Joy Division's best work that didn't make it on to either of their two proper albums (including classics like "Love Will Tear Us Apart", "Dead Souls" and "No Love Lost" to name a few). Ian Curtis counted Jim Morrison, Lou Reed, Iggy Pop and David Bowie as major influences (which with repeated listens become apparent to varying degrees in his work) though he probably never have imagined how far reaching his work would be. Though his was a tortured, ill-fated soul like Morrison's, his natural ability, ambition, and raw power far exceeded The Doors frontman, in my opinion. The lasting legacy of Joy Division is in some ways impossible to quantify--due both to their obvious influence on so many bands coupled with the relative brevity of their career and output. Their sound and style was truly before its time and laid the foundation for bands like The Cure, Depeche Mode, Nine Inch Nails and more contemporary artists like Interpol, The Horrors, and The National to name just a few. As a fan who only discovered them a few years ago, I can only relate the power found in their music and will not attempt to create another tired, academic analysis of their legacy. I only know that for me, they're the kind of band that sounds tremendous on vinyl, at night, with all the lights turned out and a drink in hand. The music simultaneously haunts and thrills, poetically stimulates and rocks. There are some bands out there that for all of you are the "beginning"--the top of a family tree of influence for so much of what you listen to. Joy Division almost surely wear that mantle--even if it was unwanted and unexpected by them some three decades ago. So in lieu of so many of you newcomers attempting to digest all this work at once, this week's playlist is my favorite dozen Joy Division songs to get you started. The accompanying audio playlist contains samples from their two proper albums as well as their recently released "best of" compilation. Enjoy these previously unknown pleasures. Yeah, I know that wasn't clever. Don't care. Do it.